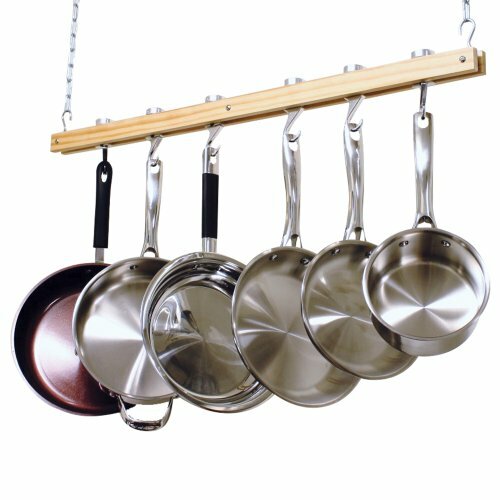 The Cooks Standard Ceiling Mounted Wooden Pot Rack, Single Bar, 36-Inch has a 36 inch single bar made of 2 wood tracks that is supported by 2 (24 inch) chains. The pot rack also comes with 6 swivel hooks that can be turned 360 degrees to adjust cookware. Supports around 30 pounds. Brackets and hooks are made of solid cast aluminum for a modern appearance and to coordinate with your kitchen and cookware’s style. Natural wood track is smooth and durable and can be mounted on a ceiling or against a wall. Saves space and helps with organization. Installation is easy with a Phillips screwdriver. Extra hooks are available, please purchase separately.